Lake Maggiore (Italian: Lago Maggiore, pronounced [ˈlaːɡo madˈdʒoːre] literally 'Greater Lake') or Lago Verbano ([verˈbaːno]; Latin: Lacus Verbanus) is a large lake located on the south side of the Alps. It is the second largest lake in Italy and the largest in southern Switzerland. The lake and its shoreline are divided between the Italian regions of Piedmont and Lombardy and the Swiss canton of Ticino. Located halfway between Lake Orta and Lake Lugano, Lake Maggiore extends for about 65 kilometres (40 miles) between Locarno and Arona. Lake Maggiore is 64.37 km (40 mi) long, and 3 to 5 km (2 to 3 mi) wide, except at the bay opening westward between Pallanza and Stresa, where it is 10 km (6 mi) wide. It is the longest Italian lake, although Lake Garda has a greater area. Its mean height above the sea level is 193 metres; a deep lake, its bottom is almost everywhere below sea-level: at its deepest, 179 metres below. Its form is very sinuous, so that there are few points from which any considerable part of its surface can be seen at a single glance. If this lessens the effect of the apparent size, it increases the variety of its scenery. While the upper end is completely alpine in character, the middle region lies between hills of gentler form, and the lower end advances to the verge of the plain of Lombardy. 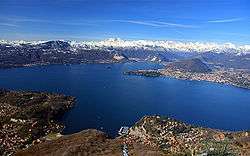 Lake Maggiore is the most westerly of the three great southern prealpine lakes, the others being Lake Como and Lake Garda. The lake basin has tectonic-glacial origins and its volume is 37 cubic kilometres (9 cu mi). The lake has a surface area of about 213 square kilometres (82 sq mi), a maximum length of 54 km (34 mi) (on a straight line) and, at its widest, is 12 km (7 mi). 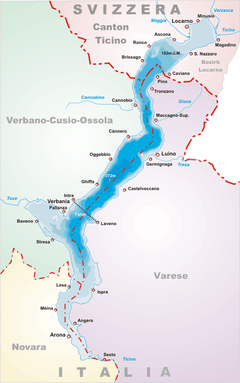 Its main tributaries are the Ticino, the Maggia, the Toce (by which it receives the outflow of Lake Orta) and the Tresa (which is the sole emissary of Lake Lugano). The rivers Verzasca, Giona, and Cannobino also flow into the lake. Its outlet is the Ticino which, in turn, joins the river Po just south-east of Pavia. The lake’s jagged banks are surrounded by the Pennine, Lepontine and Lugano Alps. Prominent peaks around the lake are the Gridone, Monte Tamaro, Monte Nudo and the Mottarone. The highest mountain overlooking Lake Maggiore is Monte Rosa (4,634 m, 15,203 ft), located about 50 kilometres (31 mi) west of it. The western bank is in Piedmont (provinces of Novara and Province of Verbano-Cusio-Ossola) and the eastern in Lombardy (province of Varese), whereas the most northerly section extends 13 kilometres (8 mi) into the canton of Ticino, where it constitutes its lowest point above sea level as well as that of Switzerland. The culminating point of the lake's drainage basin is the Grenzgipfel summit of Monte Rosa at 4,618 metres (15,151 ft) above sea level. Lake Maggiore weather is generally mild. It is known for its Mediterranean-like climate where sub-tropical plants can grow. During winter, the lake helps to maintain a higher temperature in the surrounding region (since water releases heat energy more slowly than air). The temperatures are cooled down in summer by the breezes that blow on the water's surface changing its colour. The area enjoys nearly 2300 hours of sunshine a year and an average annual temperature of 15.5 °C (60 °F). The water of the lake has a comfortable temperature of 20 °C (68 °F) to 22 °C (72 °F) in July and August. In winter snowfall is erratic and primarily affects the higher elevations. Rainfall is heaviest in May and lowest during the winter months. The Spirit of Woodstock Festival is an annual open air festival at the end of July/beginning of August at Armeno organized by the Mirapuri community. The first archaeological findings around the lake belong to nomadic people living in the area in prehistoric types. The first settlements discovered date from the Copper Age. The area was later under the control of the Ligures, later replaced by the Celts. The latter were in turn conquered by the Romans, who called the lake Verbanus Lacus or Lacus Maximus. After the fall of the Western Roman Empire, the lake was under different dominations. Most of the current settlements originated in the Middle Ages, when the lake was under the Della Torre, Visconti, the Borromeo and Habsburg families. Methane was first discovered and isolated by Alessandro Volta as he analysed marsh gas from Lake Maggiore, between 1776 and 1778. In 1936, a Bugatti Type 22 Brescia Roadster, built 1925, was sunk in the lake by employees of Zürich architect Marco Schmucklerski, when Swiss custom officials investigated whether he had paid taxes on the car. The Bugatti was attached to an iron chain making it possible to recover it once the investigation was over, yet that never happened. When the chain corroded, the car sunk to the lake bed, where it was rediscovered on 18 August 1967 by local diver Ugo Pillon and became a favourite target for divers thereafter. When one of the divers, Damiano Tamagni, was killed in a hold-up on 1 February 2008, his friends from the Ascona divers' club decided to lift and sell the carwreck to raise funds for a yet to be created foundation named after the victim. The remains of the Bugatti were recovered on 12 July 2009. The sale took place at the Retro Mobile classic car exhibition in Paris on 23 January 2010. It was sold for €260,500. Lake Maggiore is featured in American writer Ernest Hemingway's novel A Farewell To Arms. The protagonist (Frederic Henry) and his lover (Catherine Barkley) are forced to cross the transnational border within the lake in a rowing boat to escape Italian Carabinieri. ↑ 1:25,000 topographic map (Map). Swisstopo. Retrieved 2014-07-28. ↑ "RFI - 260,500 euros for rusty old car found at bottom of lake". Rfi.fr. Retrieved 2013-03-26. Wikivoyage has a travel guide for Lake Maggiore.